Click the CARD below to print or take a screenshot on your mobile phone or tablet. There is no need to download another app! If you would like to personalize your card enter your full name in the member name field below and click the Update button. All of the cards you printed are active and ready for immediate use at the pharmacy! Start saving immediately by presenting this card to the pharmacy along with your prescriptions. This program can help those with or without insurance save on prescription drugs. 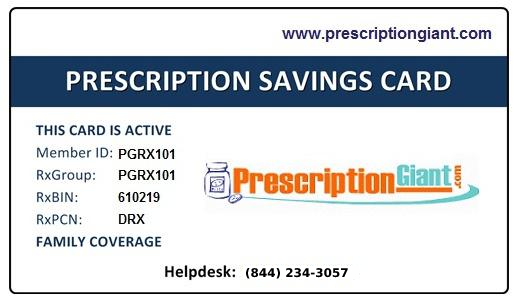 Visit your local independent pharmacy and present this card with your prescriptions for the lowest price! The card is reusable and never expires. Cardholders save up to 75% with our program. BE SURE TO SHARE THESE VALUABLE SAVINGS WITH FRIENDS AND FAMILY! Once the card is printed cut it out along the dotted line then fold in the middle and you are ready to go! If you make a mistake or lose the card, don't worry about it. Just print another one. You can print as many cards as you want and give them to your friends and family.